I fell in love in Vancouver this past summer. I still pine for my sweetheart’s comfortably utilitarian seat, her easy camaraderie, her affordability, her expansive harbor vistas, her pleasant accessibility, & her dependable, 15-minute embrace nearly all hours of the day. 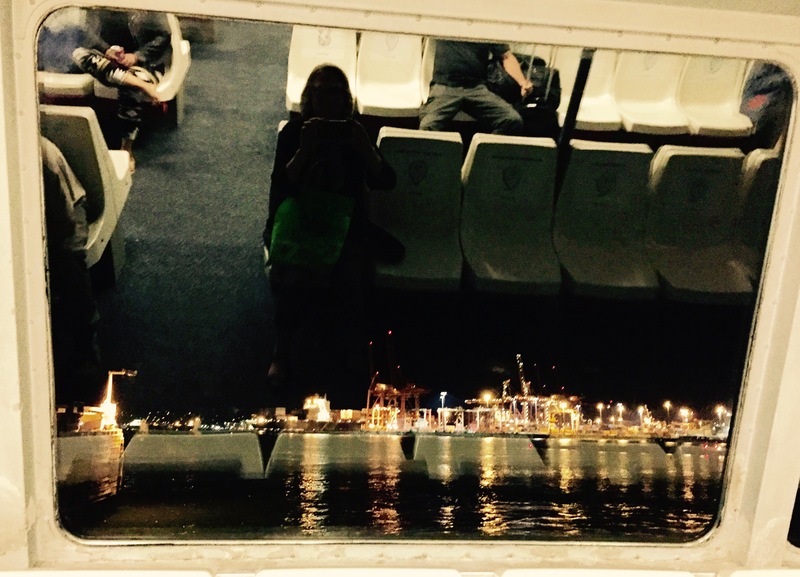 I fell madly in love with the SeaBus. Vancouver’s transit system is fantastic. Many world cities have robust transit systems, & their intentional (&/or fortuitous) combination of transit, walkability, & mixed land use makes them work. It’s why we want to visit these wonderful cities again & again. Some of the great things about transit-oriented (aka Livable) cities is that they allow for casual & (usually) positive social interactions among diverse human beings of various socio-economic groups, are healthier because people walk more, produce fewer greenhouse gasses (GHG) because people can get places without driving, promote a sense of community, provide daily opportunities for downtime & relaxation, reduce traffic stress, support mixed-use & higher density neighborhoods (thereby reducing urban sprawl), reduce isolation, & are safer overall than car-oriented cities. Consistent with its Greenest City Action Plan, the SeaBus is a key aspect of Vancouver’s regional transit system. It provides daily ferry service between Vancouver & populous North Vancouver using two huge catamarans (capacity 400) which traverse the main harbor, one departing from each side at the same time. I’d booked a hotel in North Vancouver’s Lonsdale Quay over the 4th of July (which is too damn noisy in our central CA coast neighborhood) & was worried (who me, worry?) it was too far from the action; but yay! – there was plenty of action for a transport wonk like me during those daily glides across the water. 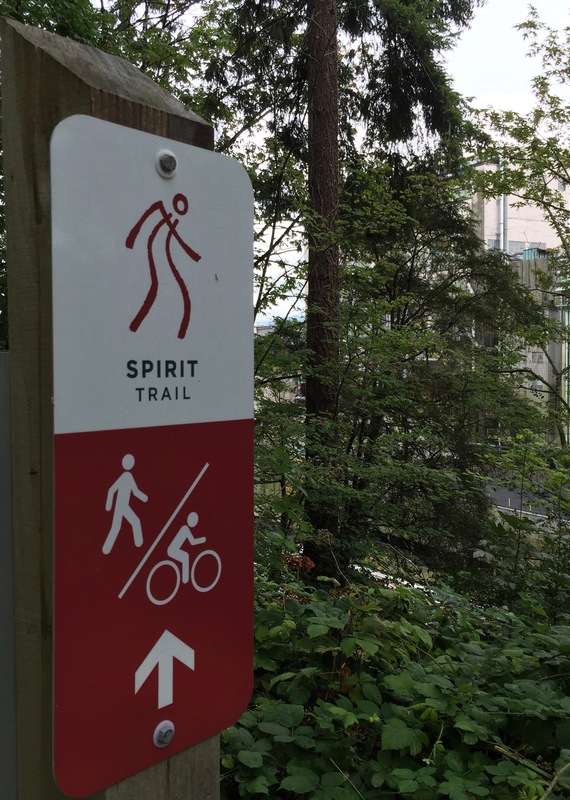 Not to mention immediately adjacent connections with the SkyTrain, Spirit Trail, Waterfront Trail, Seawall Trail, & ubiquitous buses. Why does transit in Vancouver work so well? Well, it’s a lot faster than driving, & that’s intentional. Here’s the hierarchy of transport modes from their Transportation 2040 plan: 1. Walking, 2. Cycling, 3. Transit, 4. Taxi/Commercial Transit/Shared Vehicles, 5. Private Automobiles. Ahh – be still my heart! Walking is the #1 priority transportation mode in Vancouver. Walking & transit play extremely well together (while bicycles, it seems to me, tend to prefer riding with their own kind). Please note the priority assigned to private automobiles: they’re even removing a driving lane from the historic downtown Burrard St. Bridge in order to improve pedestrian & bicycle access. ‘Shared vehicles’ etc come in at #4 – definitely part of the future but still with the downsides of contributing to congestion & inefficient land uses. Portland (my second infatuation of the summer) is another North American west coast city with thoughtful urban planning. Similar to Vancouver, they’ve intentionally made decisions about land use & transportation in concert, thereby increasing likelihood of playing-well-together. We’re not very good at this in most parts of the automobile-oriented U.S., &, frighteningly, most of us have yet to answer nature’s urgent call about global warming. Yeah I know, the human brain isn’t yet wired to spend our daily lives mindful of perceived day-after-tomorrow catastrophes. 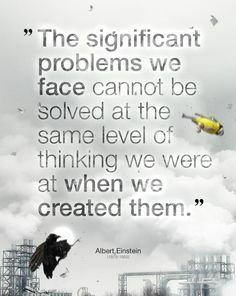 But as Albert Einstein famously said (paraphrased): “The problems of today cannot not be solved with yesterday’s way of thinking.’ We may wish & hope that doing familiar things more & better will make a difference, but if you have a habit of grounding wishes in science (& omg, we gotta fight for that harder now), it’s pretty clear we need to be forging new paths into the future. Well. That zippy SeaBus is definitely part of their future path in Vancouver. Portland’s streetcars & MAX are the foundation of their sustainable city plan, & the funkycool trams in neighboring San Francisco are a (why-don’t-we-copy-that-here??) twist on that City’s robust transit system – & soon, even more ferry’s across the Bay! I imagine we’ll all get there one of these days – it’s just a matter of .. survival. This entry was posted in A Warming Planet, Just an Everyday Life, Our Primate Nature and tagged Bay Area ferries, livable cities, north vancouver, portland transit, san francisco muni, santa cruz transit, seabus, vancouver, walking. Bookmark the permalink. Leave the car at home and walk more– I’d love it.